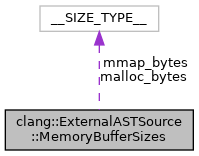 Definition at line 310 of file ExternalASTSource.h. Definition at line 314 of file ExternalASTSource.h. Definition at line 311 of file ExternalASTSource.h. Definition at line 312 of file ExternalASTSource.h.